La Trattoria is a family-orientated, neighbourhood-style Italian restaurant located in the very heart of Hamilton. Known locally as ‘The Tratt’ it offers reasonable prices and boats a loyal customer base ranging from families to young professionals. The restaurant has been in operation since the late 1970s. It runs like clockwork so it won’t be long after you’re seated before the garlic bread makes a welcome appearance. The menu is predominantly southern Italian. Its traditional thin-crust Neapolitan pizzas are prepared in the only wood-burning oven in Bermuda. There are 17 types on the menu but the chef will happily conjure up one to your specific requirements. Other classic Italian dishes are covered in a straightforward and unpretentious manner. Choices include Spaghetti Pescatore (spaghetti, a selection of seafood, garlic, white wine, and cherry tomatoes) and Linguine Con Tonno (linguine with fresh tuna, garlic, olives, cherry tomatoes and basil). As mentioned previously La Trattoria is extremely popular with families, especially in the early evening at weekends. Almost every year it wins the Kid-Friendly Restaurant award in The Bermudian magazine’s Best of Bermuda Awards. There’s a special children’s menu that’s obviously priced to keep families coming back. Options include simple Italian dishes such as Meatballs and Spaghetti plus favourites like Chicken Nuggets and Cheeseburgers. Crayons are provided to keep them busy for a while. The restaurant enjoys a central location in Hamilton but can be tricky to find if you don’t know the area. It’s on Washington Lane, a narrow alley running between Reid Street and Church Street. From the bus station, turn right onto Church Street and walk 20 yards or so until you reach City Hall. Washington Lane is directly opposite. It’s open for lunch Monday to Saturday, and dinner daily. La Trattoria is owned and managed by the Dining Bermuda, the island’s largest restaurant group. They also run the Harbourfront, Little Venice, Blu, Fourways Inn, L’Oriental, and Mickey’s. It’s well worth checking their website or Facebook page for special offers and discounts. Map showing location of La Trattoria. I found a giant cockroach on my plate of seafood pasta. I returned my plate and was waiting for the chef to come out, apologize and explain why there was a cockroach. After a while, no one came out, and no apologies from the chef or even from the waiters. We came here after reading many reviews that this was the best place to come if you had children. They were right. The waiter kept our son entertained and was also helpful when we were ordering. The pizzas were thin and crispy as they should be, and prices were moderate. Good for kids. They’ve got a special menu for them and the prices are quite fair. This is a small restaurant that can be quite difficult to find. There’s an alley between Reid Street and Church Street and this is where it is. The food is delicious and the menu offers great value, if a little dated. 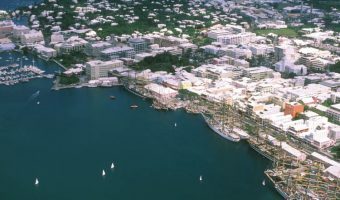 Prices are very reasonable for Bermuda. Staff went out of their way to make sure our kids had a great time. This is one of the best Italian restaurants I’ve ever been to anywhere. This is coming from someone who grew up near Philly and knows his Italian food. If you love Italian food, this is a must hit spot. I HIGHLY recommend the lasagna! Upmarket, contemporary Italian restaurant in the business district of the capital. Established more than 40 years ago.